It’s Fashion, It’s Glitz and It has a New Date! 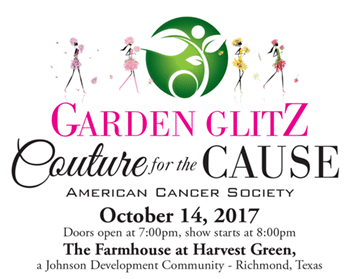 In light of the Hurricane Harvey recovery and rebuilding efforts, the Couture for the Cause Chairs and the American Cancer Society decided to postpone last month’s “Garden Glitz” event. Save the date! The premier Fort Bend County affair benefitting The American Cancer Society—a fashion-filled night of food, fun and philanthropy—is now set for April 14, 2018! Emceed by Ryan Chase of 104.1 KRBE’s Roula and Ryan Show, this year’s theme is ‘Garden Glitz.’ The event will be held at the Farmhouse in Richmond’s Harvest Green—Houston’s first farm-centric community by Johnson Development. As in years past, there’s a fashion show featuring couture models—many of whom are cancer patients or survivors—seizing their own opportunity to give back. In addition to the fashion show, you don’t want to miss the wine pull (make a donation, draw a cork, win a bottle of wine! ), Big Board (unique auction items available for bid), “Baubles & Bubbles” raffle sponsore d by Plaza Jewelers and fabulous food from local restaurants, including The Rouxpour, Pacific Coast Tacos, The Slanted Frog, Sammy’s Steakhouse, Hickory Barn BBQ, Veritas Steak & Seafood, Lupe Tortillas, Lomontes Italian Restaurant and Pizzeria, Keeper’s Japanese Restaurant, Japaneiros. Current sponsors include: Johnson Development (this year’s presenting sponsor), Houston Methodist West and Sugar Land Cancer Centers, HCSS Innovative Software, Classic Chevy Sugar Land, Fred and Mabel R. Parks Foundation, Better Homes and Gardens Real Estate Gary Greene, The University of Texas MD Anderson Cancer Center, Plaza Jewelers, UpClose Magazine, Mike & Toni Baches, Houston Dermatology & Plastic Surgery, Westin Homes, Money Management International, WJ Interests Wealth Advisors, West Law Firm, Balanced Body Image, Discount Hitch & Truck Accessories, Roberts Markel Weinberg Butler Hailey, Newmark Homes Houston, The Millis Group, and American Textile Recycling Service, Griswold Home Care, Ashley and Jim VanHoozer, Maxx Builders/Miss Pakistan 2017 Hira Khan, Renew Laser & Skin. Event tickets are $125. 100% of the proceeds benefit The American Cancer Society and their mission. For more information contact Tiziana Triolo at 713.706.5657 or Tiziana.Triolo@cancer.org.